Exos Aerospace said it's once again postponing its next suborbital sounding rocket launch from New Mexico, this time until March 2, because of ongoing effects of the government shutdown. 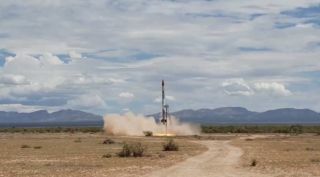 In a Jan. 22 email, John Quinn, chief operating officer of Exos, said they were delaying the launch of their SARGE reusable sounding rocket from Feb. 9 to March 2. Quinn said that, because of the shutdown, they no longer have access to NOAA wind data that's needed as part of safety analyses for their launches. The NOAA websites that have provided that data in the past now return an error message: "The website you are trying to access is not available at this time due to a lapse in appropriation." Quinn said the delay buys them time to await an end to the shutdown or "come up with a viable solution if the [government] shutdown has not been resolved by then." Exos had previously planned to carry out the launch Jan. 5, but postponed it because the FAA's Office of Commercial Space Transportation was not able to modify their license to change wind-related safety calculations in order to reduce the chance of a launch scrub. The office is not issuing new licenses or modifying existing ones, but is supporting commercial launches under existing licenses. Other companies are running into similar problems. Small launch vehicle Vector is preparing to ship a Vector-R rocket to Pacific Spaceport Complex-Alaska in February for stage testing ahead of a launch. However, that launch cannot go ahead until the shutdown ends and the FAA is able to finish processing the company's launch license application, Jim Cantrell, chief executive of Vector, tweeted Jan. 23. "Hoping DC gets its act together soon," he said, although it wasn't clear how close the company was to a launch attempt that required an FAA license. Rocket Lab also needs a new FAA license for its next Electron launch, scheduled for late February. While the company has an existing license used for its previous launches, the upcoming launch of a technology demonstration satellite for the Defense Advanced Research Projects Agency requires a new license since the launch will take a different trajectory, requiring a new safety analysis, Rocket Lab Chief Executive Peter Beck said in an interview. "We're hoping that the government will open up again soon," he said. "We need a new license for this launch since we're going to an entirely new trajectory, and that always requires a new launch license." He added that DARPA was trying to assist in getting that license approved. The lack of launch licensing processing has hit another DARPA program, the DARPA Launch Challenge prize competition. Prospective teams have until Feb. 1 to have their launch license applications formally accepted by the FAA, but the agency is not currently processing applications. Todd Master, manager of the competition at DARPA, said after a panel session Jan. 16 at the annual meeting of the Transportation Research Board here that the deadline has been extended to Feb. 15 because of the shutdown. "We'll continue to assess it as the situation progresses," he said, adding that he didn't expect other deadlines, including plans to hold the first round of the competition late this year, to be delayed. Besides launch licenses, the shutdown has delayed operations of at least one recently launched small satellite. Orbital Reflector, a smallsat developed by Trevor Paglen and the Nevada Museum of Art, was among the 64 satellites placed into orbit last month on a SpaceX Falcon 9. Once in orbit, the satellite was to deploy a balloon made with reflective material that would allow it to be seen from the ground. That deployment, though, has been delayed because of the shutdown. "The FCC had asked us to wait for their go-ahead before we deploy the balloon," the museum said in a Jan. 18 statement, in order to ensure that the deployment did not pose a hazard to other satellites. "Since the government shutdown began, communication with the FCC has been suspended, as they are not operational at this time." At NASA, operations remain limited to those required for the protection of life and property, such as operations of the International Space Station and other orbiting spacecraft. About 95 percent of the agency's civil servant workforce has remained on furlough since the shutdown started. The extended shutdown is also affecting a growing number of contracted operations that continued after the shutdown started because they were funded in advance. That includes operations of the Chandra X-Ray Observatory spacecraft, which is handled by the Chandra X-Ray Center, run by the Smithsonian Astrophysical Observatory under contract with NASA. "Since NASA is unable to provide funding during the shutdown, the Smithsonian Institution has agreed to advance funding to continue science and mission operations through mid-March, as necessary," the center said in a Jan. 22 statement. That will allow regular operations of the space telescope to continue, although the center will not issue grants to support observations or fund "non-critical expenses" like travel to conferences. Scientists supported by NASA grants are also facing furloughs because of funding that is running out. That has included the NASA Postdoctoral Fellowships, which ran out of funding Jan. 18. The Universities Space Research Association, which administers the program, said it would loan fellows the value of their stipend through the end of the month. The NASA Solicitation and Proposal Integrated Review and Evaluation System, or NSPIRES, could also soon be a victim of the shutdown. NSPIRES, which hosts agency research opportunities, posted a notice that it will be "unavailable" if the shutdown extends beyond Jan. 31. In a Jan. 23 statement, NASA Administrator Jim Bridenstine said that the agency's Day of Remembrance, an event that serves as a memorial for the Apollo 1, Challenger and Columbia accidents, would be postponed from its planned Jan. 31 date. "Unfortunately, most of our NASA family are on furlough and we recognize that participation in many of the Day of Remembrance activities would be a challenge," he said. A new date has not been set, but he said it would be a priority for the agency once the shutdown ends. Some people affiliated with NASA participated in a protest in the Hart Senate Office Building Jan. 23, calling on the Senate to pass appropriations bills that would end the shutdown at least temporarily. Several people in the crowd held up signs with the NASA logo and the words "Let NASA Work! End The Shutdown!" An opportunity to do so could come Jan. 24, when the Senate will vote on two spending bills, including one that previously passed the House that would fund agencies through Feb. 8. It's not clear that either bill can win the 60 votes needed for passage, however. The House, meanwhile, passed on a 234–180 vote Jan. 23 an omnibus appropriations bill that would fund most agencies affected by the shutdown, other than the Department of Homeland Security, for the rest of the 2019 fiscal bill. That bill, introduced last week, would give $21.5 billion to NASA. The Senate has not announced plans to consider that legislation amid the ongoing dispute about border security funding that triggered the shutdown.